Looking to protect your felt? In this buyer’s guide, we’ll review the 6 best pool table covers on the market in 2019. We’ll also outline some key things to consider when buying, making it easier for you to choose the right cover for your table. First, we’ll show you the 6 best covers for your pool table available right now in terms of value for money. There are plenty of cheap leatherette covers on the market these days, and for the most part they do a fairly good job. However, if you’ve got a $5000+ table, it’s definitely worth getting something more heavy-duty. Imperial’s cover is made of Naugahyde rather than vinyl or nylon. This material is great because it’s super tough, meaning it won’t rip easily. It’s also thick enough to withstand cat claws, and it’ll protect your felt against spilled liquids too. Another benefit of the Naugahyde is how light it is. For people with 9-foot tables, it can be a real effort to lift a full-size cover onto the surface. Having a lightweight option makes this process much easier. What’s more, Imperial’s product is the perfect size for 7, 8 and 9-foot tables – all three options are available. The cover not only protects your felt, it covers the bumpers and the outside of the pockets too. Because this is such an awesome cover, it’s fairly expensive. However, if you’ve got a top-of-the-line table, it’s definitely worth investing in the best possible protection you can get. Made of thick Naugahyde, tough and rip-resistant. Fairly light – easy to put on and take off. Available for 7, 8 and 9-foot tables. Looking for something a little cheaper? This Iszy Billiards cover is a fantastic mid-budget option. Although it’s made of vinyl rather than Naugahyde, this is still a pretty thick cover, so it’s relatively durable. It’ll easily withstand pets as well as objects like drink glasses that you happen to put on the table. Plus, this cover shields your felt against fur and dust particles in the air, and it’s great against spills – simply wipe it with a towel if it gets wet. Iszy Billiards’ cover isn’t as light as the Imperial option we just looked at. However, the company has made up for this by sewing a cotton backing onto their cover. This makes it much easier to pull across the table, allowing you to put the cover on and take it off with ease. Don’t worry about this backing messing with your felt: since it’s cotton, it doesn’t fuzz up. We’ve looked at the 8-foot option here, but this cover comes in 7-foot and 9-foot versions too. Plus. you can get it in three different colors, so it’s easy to find something that’ll match the atmosphere of your pool room. Reasonable price considering how tough it is. Available in three different styles. Iszy Billiards also makes a cheaper pool table cover. Like their more expensive option, it comes in 7-foot, 8-foot and 9-foot varieties. This is probably one of the cheapest covers on the market right now. But what are the downsides to paying so little? As a nylon (rather than faux leather) cover, this product is pretty thin. Although it withstands ripping really well, it might get punctured by particularly sharp objects. If you’ve got a kitten, you may need something a little tougher. In addition, this cover isn’t waterproof. If you spill a large amount of liquid, it’s likely that some of it will seep through the cover and reach the table. On the plus side though, the elastic corners mean that it stays on the surface really well. It’s also really light, making it super easy to put it on and take it off. Ultimately, if you just need something to protect against sunlight and dust, this is a great option. However, if you’ve got pets or kids who are likely to spill drinks, it’s better to go for something a little tougher. Available in five different colors. Thin – can get punctured easily. Another mid-market option is this Billiard Depot cover. As you’d expect from something at this price range, this is a thick cover. The leatherette is rip-resistant and won’t puncture easily. It’ll also withstand spills, and is easy to wipe down when you want to clean the dust off it. Although this cover only comes in black and brown, there are 7′, 8′, and 9′ options available, all on the same product page. This means you don’t need to scour the web to find your size! The best thing about this cover though is its durability. It won’t just protect your table – it’ll last for a long time too. The leatherette won’t fade in the sun, and the seams are very tough. Plus, this cover is a nice size – the manufacturer has evidently tested it on a range of different tables to make sure it fits well. No matter how long your table is, the cover won’t be too big, nor too small (as long as you buy the right size!). Fits really well on most tables. Only available in black & brown. Looking for something fairly cheap, but need it to be waterproof? Take a look at this NKTM cover. Although it’s more expensive than Iszy Billiards’ rip-resistant option, this cover has a little more bulk to it. It’s made of PVC, which is a bit more “rough and ready” than nylon or leatherette. This stuff is spill-proof and won’t tear easily, so it’s great for those with kids and/or pets. You can even clean it using a hose in the garden rather than having to brush the dust off by hand, which saves a heap of time. This cover also comes with a plastic hem, which makes it much harder for little ones to pull it off. Since it’s so light though, adults will find it easy to put this cover away when it’s time to play. However, it’s not incredibly long – if you’ve got net-style pockets, they might still be exposed. Unfortunately, NKTM’s cover is only made for 9′ billiard tables. If you use it on anything smaller the fabric will overhang the rails, but this isn’t necessarily a big deal for most people. Stays on the table well – elastic hem. Only available for 9′ tables. Not very long – the pockets are left exposed. 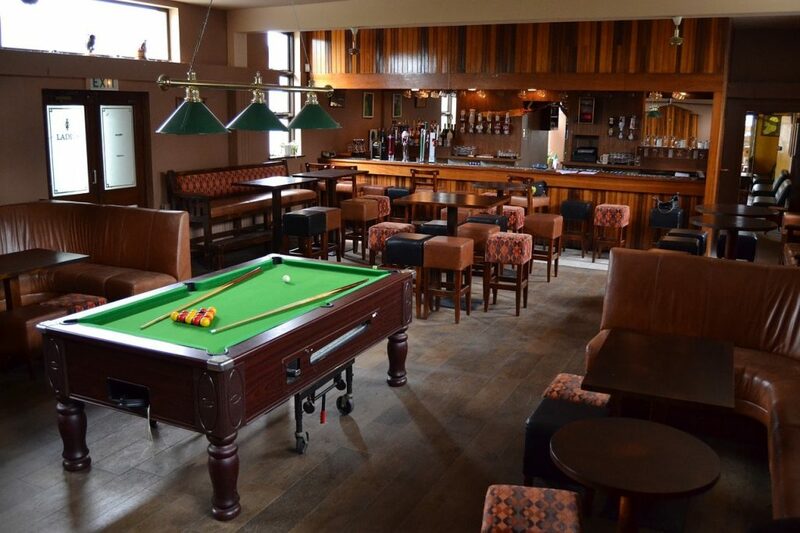 Most pool table covers are made for specific size tables. The truth of the matter though is that every table has its own little quirks – for example, yours might have really thick rails compared to most other tables. As a result, you might find yourself needing to return your cover if it doesn’t fit properly. Unlike most other options on the market, Viper’s cover is one size fits all. The obvious benefit of this is that it’ll work with basically any billiard table. However, if you’ve got a 7′ or smaller table, the cover will likely drape over the edge. If you don’t mind the look, this isn’t a big deal. Considering how cheap it is, this cover actually offers excellent protection. It’s made of vinyl, meaning it’s capable of blocking minor spills and is also tough enough to withstand cat claws and anything else you happen to place on your table. However, it is a little thin. Although it only comes in one color, the sea blue is pretty nice. Unlike the brown covers we’ve looked at so far, this one is guaranteed to avoid clashing with the palette of your upholstery and furniture. Overall, this is a really nice basic cover. It’s cheap, durable, and looks good in basically any pool room. Bit big for some smaller tables. In this part, we’ll show you what you need to know when choosing a pool table cover. Why should I cover my pool table? If you’ve got friends who get a little rowdy when they’ve had a few to drink, you’ll know that your pool table is a pretty delicate thing. It prevents the felt, rails and legs from fading in the sunlight. It stops pet hair and dust collecting on your table (it can be really hard to clean dusty felt properly). This ensures your felt plays consistently and reduces the chances of the ball bouncing when it shouldn’t. It discourages kids from climbing on the table or touching the pockets. It prevents moisture (from the air or from spilled drinks) touching the felt, stopping it from lifting from the surface. It protects the felt from cat claw scratches and other impacts (if you put stuff on your table, for example). 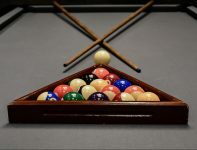 When should I cover my pool table? For those who use their table every day, covering it all the time probably isn’t necessary, unless your little ones or pets are fond of climbing on it. Put the cover on during the week if you only play at weekends. You should also use it when you go on holiday, especially if you’re going to be gone for a long time. What are pool table covers normally made of? 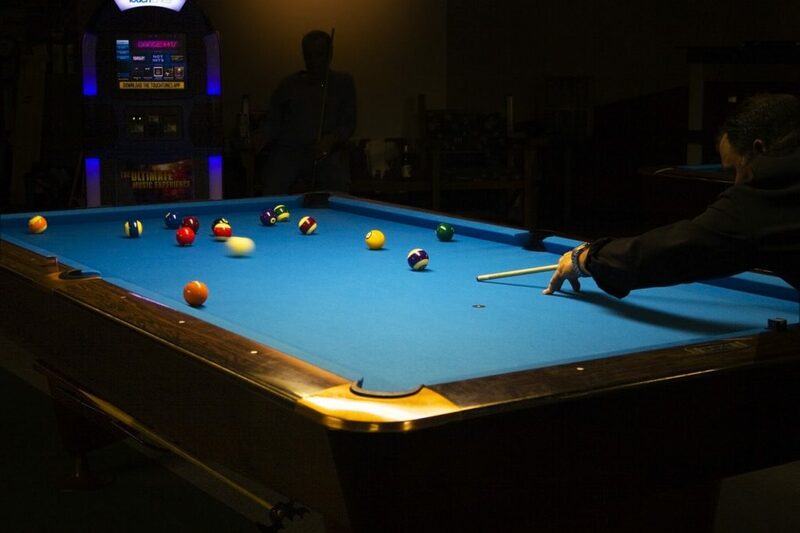 For durability and to resist spills, most pool table covers are made of artificial materials like nylon and vinyl. Some will have a softer material (like cotton) on the inside to make it easier to adjust the cover’s position. More expensive covers will be made of heavier-duty synthetics like Naugahyde. These options tend to be thicker and tougher, meaning they’re less likely to rip. Look out for leatherette or Naugahyde covers if you need something that’s waterproof. Are expensive covers worth it? If you look on Amazon, you’ll basically see two different types of pool table covers: those that cost around $20-$30, and those that cost around $50-$70. What do you have to gain by buying something more expensive? Pricier options tend to be thicker, meaning they last longer and will better protect your table if you put stuff on it. They’re also typically resistant to ripping (as we just discussed), and can be easier to put on and take off, because they’re lighter and sometimes have a smooth lining on the inside. On the other hand, cheaper covers may not be waterproof, meaning they won’t protect against spilled drinks. Some aren’t thick enough to withstand scratches – if your cat climbs on the table, its claws may puncture the cover. They’re meant to protect against dust and sunlight rather than kids and pets. Ultimately, if you need the best possible protection, buying an expensive cover is definitely worth it. You’ve reached the end of our buyer’s guide! Hopefully you found the right cover for your table. If you’re still unsure what to buy, leave a comment below and we’ll get right back to you.